We are launching an ICO to allow Nonprofits to accept cryptocurrencies and ultimately raise more money using Blockchain Technology. Our goals are to increase transparency, decrease processing fees, and automate financial reporting within the Nonprofit Space. We believe SupPorter offers a rare opportunity to invest in Blockchain Technology while making the world a better and brighter place. People don’t trust charities, and for good reason. This trillion dollar industry is plagued with scandal and rampant irresponsible spending. Sometimes, as little as 3% of a donation actually supports the cause it was intended for (https://www.rd.com/culture/how-charities-spend-money/). So what happened to the other 97%? Unfortunately, there’s never been a real way of finding out. That is, until now. 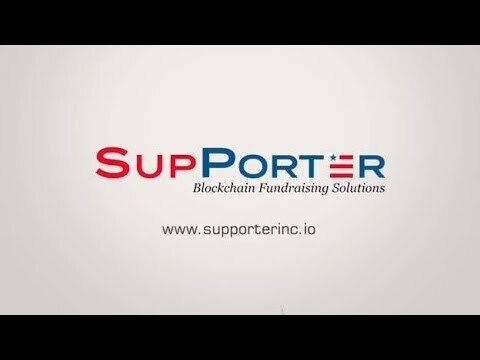 Introducing SupPorter, the world’s first Blockchain Enabled Donation Processing System, for Nonprofits and Political Campaigns. SupPorter utilizes new, cutting edge innovations in Blockchain Technology to shed some light on an otherwise dark and inefficient fundraising space. SupPorter will provide a faster, cheaper and more transparent way to donate. What makes SupPorter ideal for an ICO, is that it is a company that already exist in the fundraising space with an experienced team that knows first hand the problems facing the industry. It’s not some bold idea or concept scribbled on a napkin. SupPorter has a working prototype, App and Website that already allows organizations to raise funds at the lowest fees in the industry (www.supporterinc.com). SupPorter is positioned perfectly to be one of the first companies capable of disrupting the massive fundraising industry by taking its existing business model and merging it with new innovations in blockchain technology. You can think of SupPorter as a new global standard for the fundraising industry. I fully accept the fact that blockchain works perfectly well for charity industry. But I think we have some problems in this particular project with the knowledge of industry and marketing data. You are not the first one or "early mover". There have been about a dozen of charity projects on blockchain, a few of them have been somewhat successful. Except for lack of competitive analysis etc here, the Whitepaper is in general very badly done. Looks like the team have not examined the Token Sale practice, economics of token etc and is not well prepared for the ICO. There are many many projects already attempting to do this hence SupPorter definitely isn't the first. Blockchain is a real use case for charity donations however the team does not look well equipped enough to proceed with an ICOs nor truly look like they want to help this industry. Would be willing to change my rating if the team would reach out as I would hate to see people profiting off in the name of charity. I'm not seeing anything ground breaking here, as mentioned on other ratings, there are many similar projects. With that being said, I think the fundraising niche is big enough to cater for a few players in this niche. This project has a decent sized team with a diverse background. Modest and trying to do something of real value. This team does not have to be knowledgable on ICO practices, they deserve support because with their skill sets they can do many things, yet they choose to do something good for the world. Good luck! Guyton Porter is currently a consultant at First Access Entertainment. SupPorter, Inc. founded by Founder and CEO Inman Porter and his three brothers as a side business. SupPorter MVP App listed on both the Apple and Android App Stores. Inman Porter Quits his banking job in New York to move to his homestate of Georgia to work on SupPorter Full Time. SupPorter was awarded an Office Space Scholarship at The Atlanta Tech Village, the nation’s 4th Tech Hub. SupPorter Announces plan to launch an ICO to merge existing platform with Blockchain Functionality. SupPorter finishes building out its core team brings together an impressive board of advisors. SupPorter launches its Pre-Sale ICO with the help of StartEngine.com, a leading ICO Crowdfunding Company. SupPorter featured in Hypepotamus.com (https://hypepotamus.com/companies/supporter/). SupPorter 2.0 platform released with Blockchain functionality (ANTICIPATED). SupPorter Token is listed on multiple exchanges providing liquidity for investors (ANTICIPATED). SupPorter onboard its 300th Client (ANTICIPATED). SupPorter undergoes rapid growth and processes $36M worth of Donations through its platform (ANTICIPATED).